West 7th would end up like Minnehaha Ave from 52nd to 54th St along the Blue Line (or not much better). Not nearly that bad. West 7th is 15 feet wider than Minnehaha. Minnehaha/Blue Line is much more like what your earlier proposal for Smith Ave would be...both have similar width. mattaudio wrote: I'd still prefer a gauntlet track with dedicated ROW for certain stretches of West 7th rather than shared traffic ROW. Are there any examples of gauntlet track for LRT or modern streetcar anywhere in the US or Canada? If not, then it's probably not on the table. I agree that the line must serve the core of DT St Paul, and froggies' map and twincitizen's explanation of the compromises involved are appropriate. Would it make sense to have a station between Davern and Montreal? There's lots of low-density superblock-style stuff there, but also a decent number of apartments, IIRC. 5th St in this scheme could potentially be turned into a pedestrian/transit mall from Minnesota all the way out to 7th, with provision for car/truck access needed for only two buildings: Lawson/Infor and the Ordway loading dock. nate wrote: I agree that the line must serve the core of DT St Paul, and froggies' map and twincitizen's explanation of the compromises involved are appropriate. Would it make sense to have a station between Davern and Montreal? There's lots of low-density superblock-style stuff there, but also a decent number of apartments, IIRC. Would it make sense to have a station between Davern and Montreal? There's lots of low-density superblock-style stuff there, but also a decent number of apartments, IIRC. I thought about this and concluded that it would be appropriate if/when that area was redeveloped. I'd probably put it on Homer, though Rankin is a possibility. I also thought about shifting my Davern station east and putting another station on Edgcumbe. My concept kept 5th St as a single-lane one-way. There's adequate width to do that, dedicated LRT guideway, and sidewalks. While a mixed traffic streetcar portion would only cause a small increase in travel time, which would be fine, a greater concern would be the decrease in reliability. Reliability is supposed to be one of the advantages of lrt over buses, and we shouldn't sacrifice it. twincitizen wrote: Are there any examples of gauntlet track for LRT or modern streetcar anywhere in the US or Canada? If not, then it's probably not on the table. It's such a simple technology that I don't see why it should be a barrier, even if it doesn't exist in North America yet. Hmm. I haven't given this a whole lot of thought yet, but maybe using Forbes Avenue and Exchange Street to get to Kellogg Boulevard would work. It would be a bit of a challenge to get to the existing LRT tracks, though maybe running straight down Kellogg makes sense (although the pinch point between Market Street and St. Peter Street could be a problem, not to mention that the street is being rebuilt in that area right now). It might just barely work to go up Washington Street to 5th and then follow the tracks from there. I've been thinking this. Rush and Riverview would do well interlined, and they could interline via Kellogg, easing the difficulty in getting both lines downtown. Rebuilding Kellogg, replacing the Kellogg bridge, etc, while running the tracks through, would make a lot of sense. It would also give St Paul the excuse they want for a new Kellogg bridge, much more so than gateway does. A vertical connection at wabasha incorporating the river walk balcony would reach parts of DTSTP not reached by the green line nor using that alignment. You'd have a stop right in front of city hall, or even a bit father west (science museum, ordway, rice park, etc). The ford spur is a gift dropped right into our lap. There are several potential stops which would be served by that alignment: such as.... Hazelden, Schmidt, 7th and Madison high density housing, & the Ford site. So if a 7th street alignment is chosen, what should Be done with the Ford spur? A bike trail? One exists right next to the river. I think that LRT down 7th street would be pretty traumatic to the mom and pop businesses and gaining their support would be like pulling teeth. - How to route the transit line between the Ford Spur and SPUD without using West 7th? This has been discussed earlier in this thread, and IMO it's not feasible. - How to connect the LRT to the SPUD concourse? Theoretically possible, but wouldn't be easy. The 2003 SPUD study recommended turning from 4th down Sibley then gradually elevating to the platform level, with LRT going between Platforms Five and Six. To follow this routing today would require cutting into the park at the south corner of 4th and Sibley, running on the upper edge of the Lowertown Parking Ramp, crossing a skyway on that parking ramp, and bridging over Sibley and Kellogg in order to tie into the depot concourse. From what I can see, there's one other option that could be used, but would be both difficult and expensive in its own right. Instead of turning down Sibley, the LRT could turn down Robert St, via some combination of Robert St narrowing and/or utilizing the plaza in front of the Burger Federal Building (USDOJ and the FBI would probably not like EITHER option). 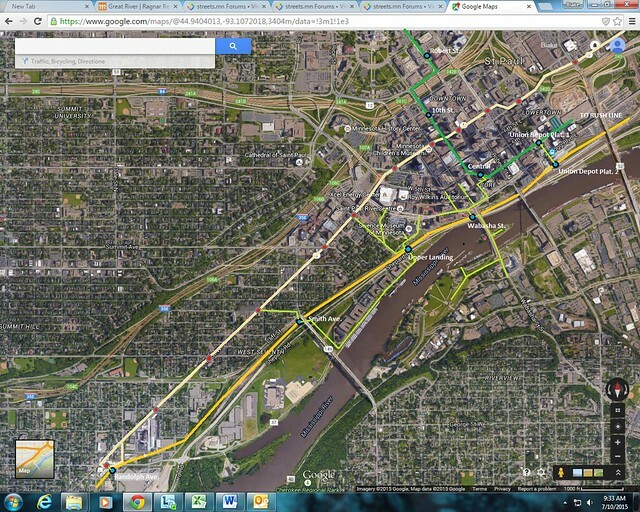 The line would then cross Kellogg Blvd, turn left, and bridge over 2nd St down to the SPUD concourse. - Ford site or Airport? I've always chosen the latter. It provides better regional connectivity in my view and finishes the 3rd leg of a triangle connecting the two downtowns and the airport. While it wouldn't be impossible to do the same using the Ford Spur, it would add considerable distance (over 3 miles) to the StP-Airport trip, and the ability to interline the Blue Line with a line on 46th St would be very difficult. More likely, they'd have to be separate, which would incur a "mode transfer penalty" to Airport-StP trips. The likelihood of being able to fund/build both the Ford Spur to 46th and a more direct Airport-StP transit line is exceedingly small. Here is a quick, low quality Paint concept I made between SPUD and Randolph Ave using the CPR ROW. I feel that the increased travel time, lower cost, and lack of traffic/street environment impact make using the CPR route much more realistic and beneficial than running the line downtown, considering it only makes a difference of a few blocks. Running the line closer to the river also makes it more useful and accessible to those on the south side of the river. Any gaps in service to destinations (namely the W. 7th district down to Randolph.) would be filled in by the streetcar line being planned, which conventiently ends at Randolph Ave., right where the CPR line meets up with W. 7th. I honestly believe the combination of a LRT line up the the SPUD concourse and the W. 7th Streetcar is perfect. The map I drew up shows the Riverview line in gold, the Green Line in green ( ) and the W 7th. Streetcar in pale yellow. The thin bright green lines are what I believe are logical and useful pedestrian connections to the Riverview stations, showing that the difference in accessibility compared to running the line downtown is not very serious, and in fact more logical. There is never going to be LRT AND streetcar in this corridor. Full stop. If LRT is chosen along the RR corridor, it will be tough sledding to even upgrade the 54 to the "B-Line" aBRT. I'd like to see LRT along the RR corridor (though hopping into DT St. Paul rather than following the river bottom to the SPUD corridor), and a good match would then be aBRT for the 74 (with a connection between the two where the CP Ford Spur "kisses" the intersection of Randolph and West 7th). If we decided on where Riverview LRT would go and not go (rail spur instead of 7th corridor) then we can ideally bump up aBRT upgrades on this stretch for either the 54 or the 74 in the near term while we await Riverview LRT. Added bonus: 74 as aBRT would serve Ford Site redevelopment in the short term. Added bonus: 74 as aBRT would share a few A-Line stations already under construction along 46th/Ford Pkwy. twincitizen wrote: There is never going to be LRT AND streetcar in this corridor. Full stop. You're right, that was a point that I was going to bring up but decided against simply because of time. Having both streetcar and LRT is highly unrealistic, however the function would essentially remain the same with the B-line aBRT. If neither happened, I still believe that the CPR corridor is the better option, as the only difference that it would really make to have the LRT on W. 7th would be better service on W 7th./United Hospital. I don't think there is any need (or support) for the LRT to be routed on W. 7th. 1) There are a number of topographical pinch points in the river valley, especially at Wabasha St and just west of Chestnut St.
2) Stations would require significant vertical circulation...at least a 40ft elevation difference at Smith Ave, likely more. 3) Because of the river bluffs, the area between Western Ave and Chestnut St just doesn't have much to support transit stations, not even at Smith Ave.
4) Putting LRT along the rail corridor effectively means that you'll never double-track the CP Merriam Park Subdivision, which would become important in the future should additional passenger rail service west of SPUD be desired. So they *really* want to build Riverview - they're budgeting that CTIB cover 80% of the cost, with no federal share. Why is Riverview so high on their priority list, and so low on Met Council's priority list? Basically CTIB is saying they'll pay to just make this happen, and without federal funding it could be built quickly. Presumably they're doing that to try to make it too enticing to ignore for Met Council, but Met Council isn't biting, it seems.